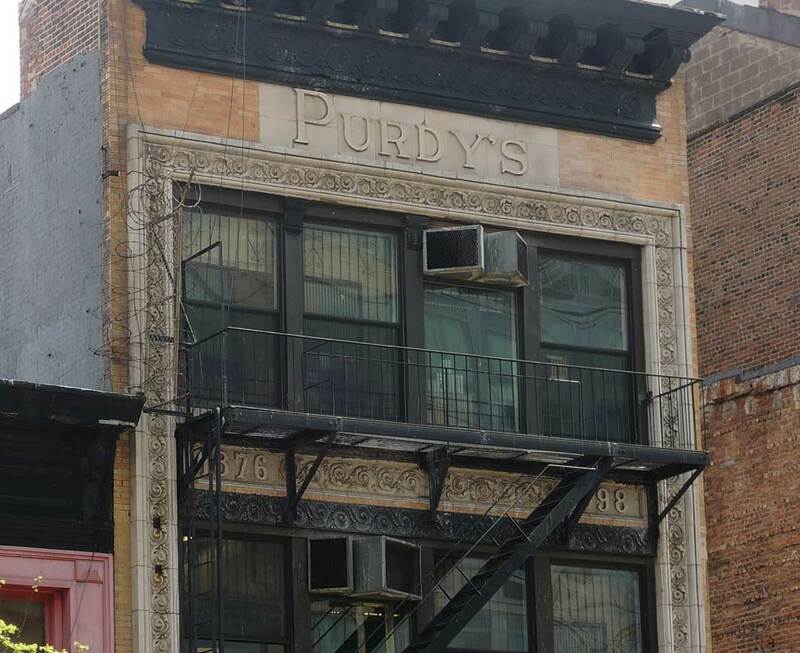 The PURDY'S at 2195 Third Avenue was Purdy's Bakers, located here from 1887 to 1918. The founder was James Seaman Purdy (1825-1890). James S. Purdy was a native of Annandale, Fairfax County, Virginia. By 1847 he married Anna Eliza Secor in New York City, 3 November 1847. In 1870 he and Anna Secor lived in Brooklyn with four children ranging in age from 11 to 21. The children were all born in Virginia. In 1880 the couple lived on East 126th Street in New York. At this time Purdy identified himself as a baker, as were two sons, William Truslow Purdy (1850-1914) and James Howard Purdy (1859-1941). The bakery was known as J. S. Purdy's & Sons from its inception. New York city directories list four Purdy bakery locations in 1887. These were all on Third Avenue, numbers 1888, 1999, 2195 and 2320 Third Ave. 1888 3rd Ave. was near 104th St., 1999 near 110 St., 2195 between 119th & 120th, and 2320 3rd Ave. was on the southeast corner of 126th St. This meant four bakeries in a space of 20-some blocks. Every five blocks you could find another Purdy's! In 1900 another bakery was added at 230 Willis Avenue in the Bronx. For a short while (1902 to 1903) another existed at 172 East 126th St. For many years James S. Purdy and William T. Purdy lived at 40 East 126th St. Funeral services for several of the Purdys were held at St. James M. E. Church located on the corner of Madison Avenue and 126th Street. After their father's death in 1890, William T. Purdy and James H. Purdy continued the business. William Purdy died in 1914, and James H. Purdy continued for another few years. The last Purdy's bakery closed in 1918. Another member of the Purdy family was James Howard Purdy Jr. (1892-1986), a lawyer in New York City for many years. The Purdys are listed in the Roll of Associates: Founders and Patriots, Vol. III, beginning with Samuel Purdy, born Rye, NY, 1 May 1695, died 5 April 1753. The span of dates (1876 and 1898) on the facade at 2195 3rd Ave. is a bit puzzling. Usually dates of this kind refer to the founding of a business or organization and the date of a building's erection. But these don't seem to fit Purdy's. It's possible the building was rebuilt in 1898 and that James S. Purdy was a baker elsewhere by 1876, but I have not found evidence for either of these.